Significantly reduces flatulence and bloating. Used to relieve various intestinal problems. Activated charcoal is charcoal that has been treated to increase its ability to adsorb gases, liquids and substances dissolved directly in the digestive tract. ¤ Activated charcoal has a well-established reputation as a universal antidote. It adsorbs most organic chemicals, many inorganic substances and innumerable poisons before they can cause harm. It is therefore widely used to treat poisoning in children by household products. 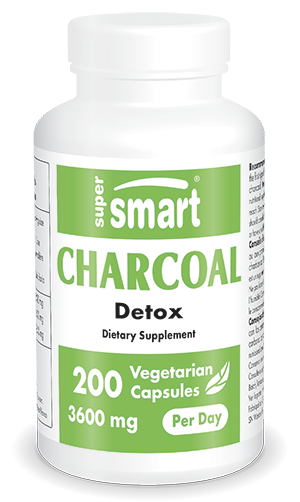 Activated charcoal rapidly adsorbs toxic or irritant substances by attaching to them in the stomach and intestines. Adults. At the first sign of intestinal problems, take 2 to 3 capsules after each of your three meals. Each capsule contains 400 mg of activated charcoal.